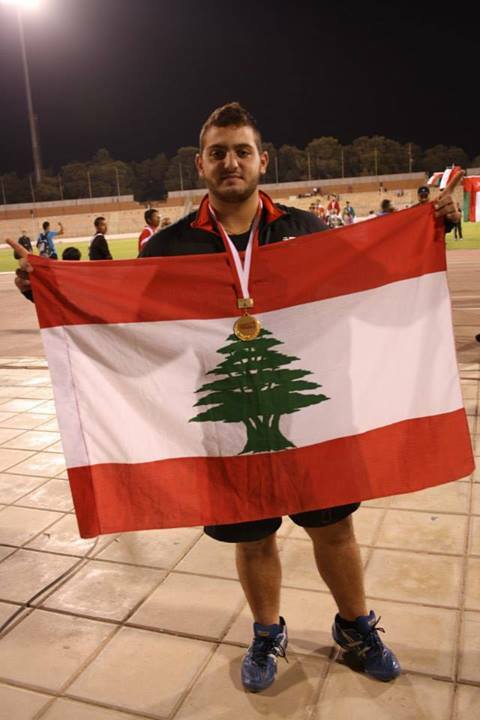 Alain Saad won the only Gold for Lebanon in this championship, throwing a 16.22 meters in the shot put breaking the Lebanese youth record. 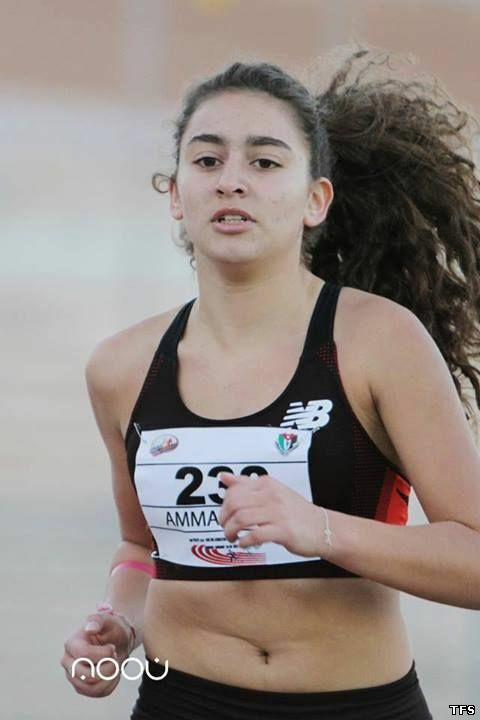 Two silver medals were won by Sandy Karam in 5km Race Walking (29:25) on the first day, first competition in the championship, and through Joy Abousleiman in the Long Jump with 4.80 meters. Joy was ranked 4th in the triple jump with 10.05m. 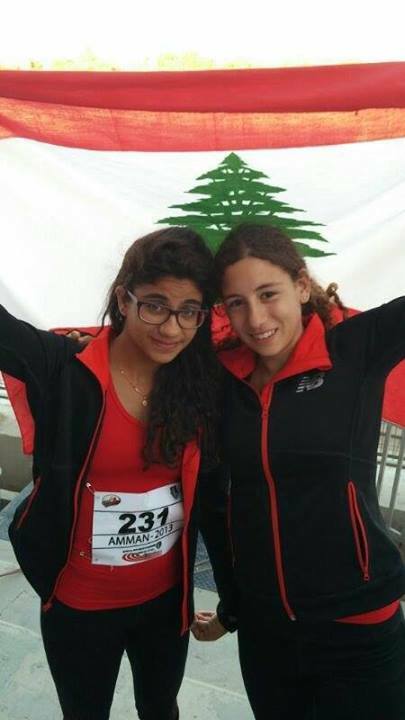 Sara-Joe Kortbawi and Joelle Feghali both won bronze medals for Lebanon in the 1500m and the 400 meters respectively. Christopher Boulos finished 4th in the 100 meters final, after winning his heat, and was placed 6th in the 200 meters. Ahmad Chour finished 6th in the 800 meters. The girls ran the medley relay and were placed 4th, with Sandy Karam on 100m, Joy Abousleiman on 200m, Joelle Feghali on 300 meters and Sarah-Joe Kortbawi on 400m. What were the problems that you faced at the beginning of the race walking event? The race walking was the first event of the championship and the judges seemed not to be ready, and they opened a debate about the place of warming up, so we lost a lot of time before they took us to the right place. At the end we didn't have enough time to warm up. Although, before the start, the judges wanted me to remove the stripe from my knee, while the other girls were wearing a long thigh, which is not acceptable by the rules of the IAAF. How can you describe the race and your opponents? The race wasn't that good, the weather was so dry and it didn't help especially under the sun. There was a tough competition between the Syrian athlete and myself, but we haven't done our best times because of the technical problems that occurred. We heard that there was a problem in the ranking of the Triple Jump event, what happened exactly? I finished my triple jump competition with 5 fouls and a 10.05m jump. 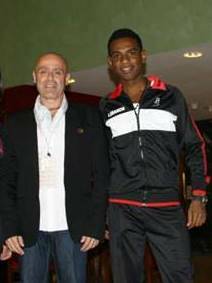 The best jump of the Jordanian athlete that was competing against me was 10.02 meters. Both Alice and the coach of Qatar wrote down each performance of each athlete. At the end of the competition, I was ranked 2nd and the Qatari girl 3rd but she had jumped 10.12m and they had written 10.02m. So we told them that it was wrong, and that I was ranked 3rd and not the qatari. After a meeting, the judges decided that I was 4th and the Jordanian was 3rd with a 10.05m jump. How did you manage to pick up and win the silver medal in the Long Jump after this incident? This incident hurt me a lot and I was really angry and couldn't forget what they did. I wanted my revenge with a Gold medal in Long Jump. I did my best to win this medal but finished 2nd. How did you prepare for this championship and what were your goals? I was preparing the whole summer, between training and participating in different competitions, especially the Open Club Championship that helped me seeing where I am at, and what my level is at the time, and of course strengthen myself. My goal was to try to win a medal for my country since I was selected on the national team, and my second goal was to beat my record. You won the Bronze medal in 400 meters, tell us more about the race, what were you thinking before, during and after the race? Before the 400 meters and after seeing my opponents, I thought that I had a minimal chance to win. In the race, I gave everything I had to the last meter and I won the 3rd place, which made me very happy and proud to raise the colors of my country high. Tell us what your plan for the 1500m race was and how did it go? First of all, I didn't think that the level of competition will be high, I thought that I will win easily. There was also many naturalized athletes and I think that it's not a good thing, because we are still Youth, they are still young, so when naturalized athletes take part in the national team, the young athletes of the country will not be encouraged to continue in the field, they will take their place in the team. What happened in the 800 meters? How did you run and what was your tactic? First, I wanted to go on a sub 2 minutes in this 800 meters run, so my tactic was to run the first lap in 56 seconds and give all I have in the second one and try to resist till the end. I was very cool and untroubled, but when I entered the Track for the event, I was so nervous seeing my opponents. The race started very slow, I was afraid to pass them, and on the 500 meters I felt tense in my body and tiredness. I began to jump like a rabbit instead of running and pushing forward. It was the worst 800m ever. How many years have you been training? and what is your weakness in the 800 meters? I started training this year 2 months before Nanjing (Youth Asian Championship), and 4 days a week, now I'm training only 3 times per week because of school. I started track and field 3 years and a half ago, at 12 years of age. This year I had to stop 3 months ago to study for the official exams, but usually I don't stop training. My weak point in 800 meters is that I feel tiredness between 400 and 600 meters, I feel sore so I don't know if I have to run faster or not at that time. The fact that Elias Makhoul, a Syrian athlete but who lives in Lebanon and train with you was running the 800 meters on your side at the West Asian championship, didn't let you feel more confident and more relaxed? I didn't focus on Elias, I counted him as one of my opponents even if trains with me. Finally, I want to say that this was the worst race of my life, but I promise that I will work much harder to break the Lebanese record of my category! It's only a matter of time! You finished first in your heat in 100m, but couldn't get on the podium in the final. How did u felt after winning your heat and what were your thoughts before and after the final? I was so happy to finish first in my heat, of course, but I knew that winning a medal in the final was very hard. I did my best and I was satisfied with my results. I started training one year ago, and these championships helped me to see where I am comparing to other athletes from different countries. The experience for the athlete is very important, and these championships can tell how strong the athlete is outside his country, and local competitions. Tell us how the 200 meters went? In the 200 meters race, the level was very high, I finished 6th and I am also satisfied with my result. We are now in October, at the end of the season, how did you prepare for this championship? When asked about their thoughts regarding the organization and the level of this championship, all the athletes said that the level of the competition was higher than the last edition, and the organization was not good compared to the Arab championship or the Asian Championship in Nanjing. They were faced to some problems, especially the respect of the schedule. "Every medal was hard to get. The organization was not professional though; I jumped at 7pm when I was supposed to jump at 5:50pm. But it feels great to be on the podium with the Lebanese flag on your back" Said Joy Abousleiman. "The time clocked by the first two girls in the 200 meters and 400 meters are similar to the winner of the Arab Youth Championship, so it was difficult for me to be on the podium in 200 meters. On the other hand, this pushes me to train harder to beat them next time." said Joelle Feghali. "The ambiance of the competition and the spirit between the athletes and the countries was amazing. Despite the lack of organization, this magic of competition and the magnificent spirit between the athletes is the most important." Sandy Karam. "The advantage in this competition was always for the Jordanian athletes. In China, at the Asian Championship in Nanjing, the organization was excellent and the level was also high." Sara Joe Kortbawi. "In Nanjing, I felt like I was at an International competition and everything was so well organized!" Ahmad Chour. "The level of this championship was high, and comparing to the Arab championship, it was the same level." Christopher Boulos.